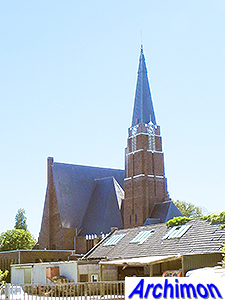 Although most of the surrounding region was traditionally catholic or reformed, in Andijk the gereformeerden formed a large community largely made up of bulb farmers. 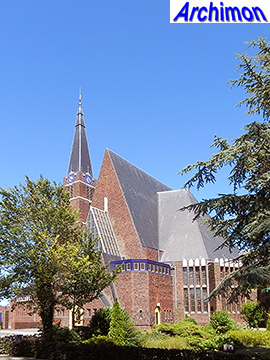 Although their church had been enlarged in 1905, by the 1920's the need for a bigger church arose. This need did not change when a part of the community split in 1928 and had themselves built a new church elsewhere in the village. At first there was talk of enlarging the old church once again, but eventually it became clear that only parts of the walls could be reused. As horticulture flourished in those years and had brought increased prosperity to the community, enough money could be collected for a larger complex with a church, a vicarage, a parsonage and several meeting rooms. 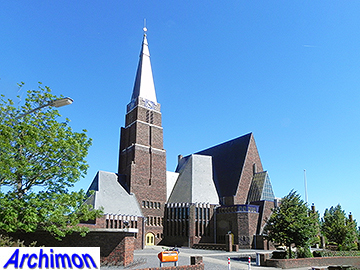 Quite possibly there was also a wish for a building that could visually rival the catholic church of nearby Wervershoof. 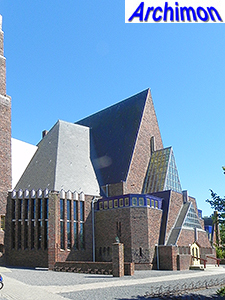 Architect E. Reitsma was chosen, out of two candidates, and in January 1929 he presented his design. It turned out to be much too expensive. 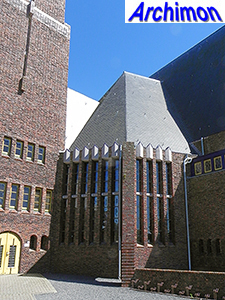 When this meant the tower could be ommitted, Reitsma made a new plan, lowered his fee and even donated a substantial sum of money in order to fulfill his architectural vision. This plan was accepted and in April the construction was tendered. Work began in July and continued until September 1930. 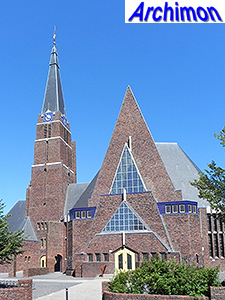 Reitsma had designed a big church in an Expressionist style more closely related to German Expressionism than to the Amsterdam School. 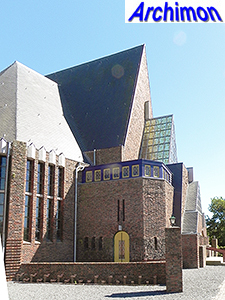 He used a similar style for his previous church, the Gereformeerde kerk in Weesp, which was under construction at that time and which was destroyed by fire in 1968. 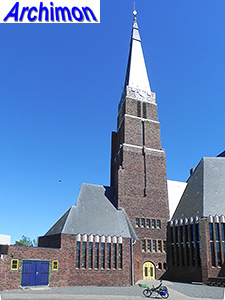 In some ways the church of Andijk is a bigger version of that church, being an aisleless cruciform church with a tall main space with slightly lower polygonal transept arms on both sides and a tower at the left hand side. 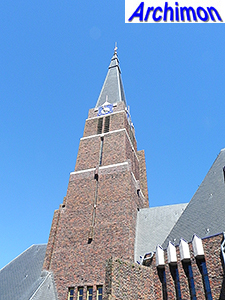 While the tower of the Weesp church was low and crowned by a tall spire, the one of Andijk is of more traditional proportions and consists of three segments of decreasing width. 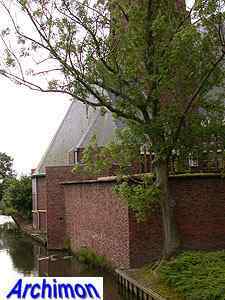 The lower and biggest segment contains the parsonage. Attached to the other side of the tower are the meeting rooms. On the right hand side of the church is a vicarage. 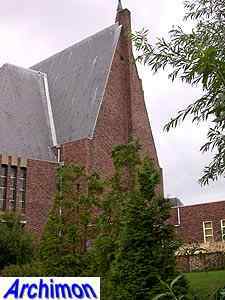 The church is constructed with a skeleton of reinforced concrete. The exterior walls are made of so-called mondsteen, bricks that in the oven had been too close to the fire and were partly burnt and warped, laid in various different patterns. 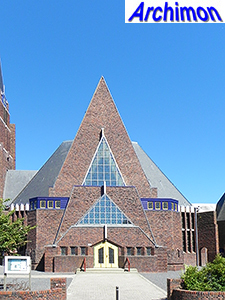 The front of the nave is dominated by two triangular glass roofs, the lowest of one illumates the consistory above the main portal while the second illuminates the nave itself. 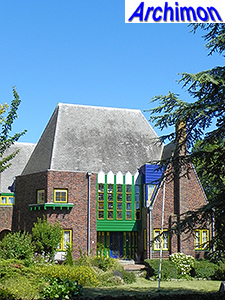 On both sides of the portal are stair-houses leading to the galery. 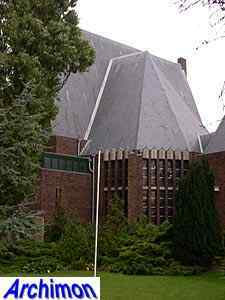 The front of the church contrasts sharply with its back, which is only a blind wall with a chimney. The whole complex is covered with a slate roof. The nave and transept form a single twelve-sided space with a galery all around. On the outside corners of the church are big buttreses with arched passages. Daylight enters the space through the windows in the transept. 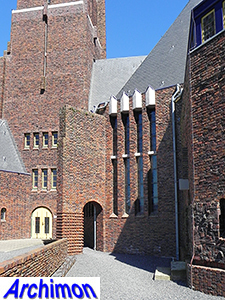 The space is mostly covered by large wooden vaults between two brickwork parabola arches. Part of the interior, most notably the vaults, was decorated with colourful reliefs and paintings in bright colours. In 1930 Reitsma was asked to tone down the colours, which he did by adding a transparent coat of brown. In 2010 the original colours were restored as part of a larger restoration which lasted until 2015. 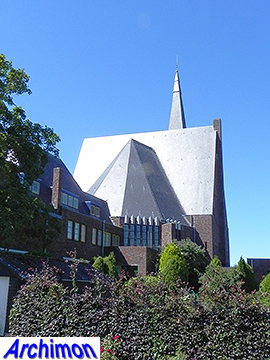 The church of Andijk is the absolute highlight in Reitsma's career and marks the end of his Expressionist period. 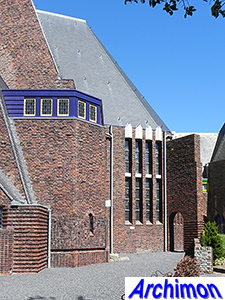 After Andijk, his designs were in a much more Traditionalist style.